Tonight is the big game and everyone is preparing their appetizers to eat during the game. I really only watch the game for the commercials. The best part of a Super Bowl party is the food. I wish I could say I had a winner for you, but unfortunately I did not enjoy this appetizer I made. It is a simple one and doesn’t take very long at all to make. 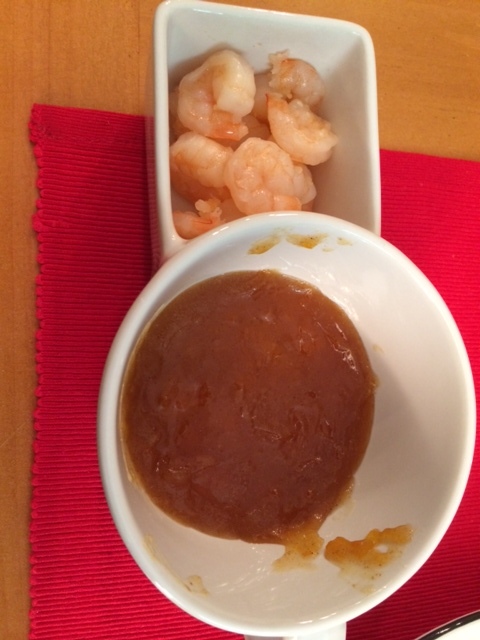 I present to you Apricot Ginger Shrimp. Put in a saucepan and stir until melted. Done! *When it is off heat, the sauce becomes more of a jam than a sauce. You will need to keep stirring it if you are putting it out as a dip. I think if I liked ginger I would have liked it. It wasn’t horrible. It is confirmed, I hate ginger. GIve ginger another chance. It’s the best!